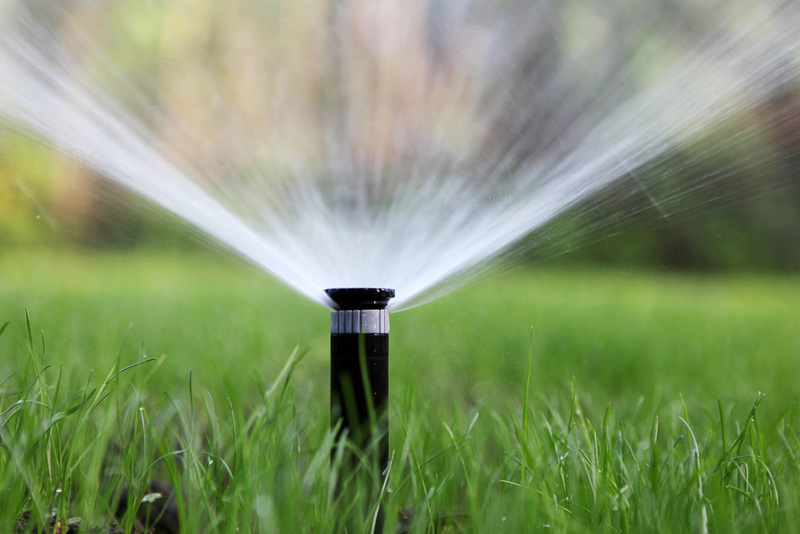 Here’s how to get your irrigation system to work, and you aren’t going to like it one bit. But take heart, your landscape will love you for it. Here’s the problem: you think your irrigation system works like your furnace and air conditioner, but it doesn’t work that way at all. Although the two systems have some analogous parts, the brains of the two systems are NOTHING alike. Once you understand the difference, you can make your irrigation do its job. Your heating/air conditioning system is controlled by a THERMOSTAT. Your thermostat keeps your temperature around a certain point that you select. It does this, in the case of your heat, by turning your furnace on when the temperature gets too low, and then off again when it gets too warm. So, the temperature is always within a narrow range around your set point. Your irrigation system is controlled by a TIMER. This timer is often called a controller. It’s just a clock – a clock with a lot of settings that tells the system when to turn on, and how long to run. You think of your irrigation controller/timer as a thermostat, when in fact, it is not. It dumbly goes on and off, regardless of how wet it is outside. Think of it this way: What if your heating system was controlled by a clock set to go on and off at certain times? Your house would always be baking hot or freezing cold – it would hardly ever be just right. If you replaced your thermostat with an irrigation controller, the furnace (or A/C) would run for a certain amount of time each day, regardless of whether it was zero degrees outside or sixty degrees. It would always be way too hot or way too cold in your house. An irrigation component that would be analogous to a thermostat would be a moisture sensor. If things were really dry, the system would run for a long time until the landscape had a good soaking, and then it would turn off. If the sensor picked up wet conditions, it would not go on. If and how long it would go on would depend on how wet the soil was. Here’s the problem in a nutshell. Your irrigation controller is just a complicated timer. There is nothing thermostat-y about it at all. It just lets water blast out on a schedule. It does this regardless of any environmental factors like wind, sun, and rain. Here’s what you need to do. You need to be the irrigation system’s thermostat. You need to be the system’s AQUASTAT! Your thermostat constantly monitors the indoor environment. It reacts to conditions (air temperature), directing the furnace or air conditioner to turn on and off to maintain the right temperature. With your irrigation system, you must be the thing that monitors the environment. People typically set it once at the beginning of the season and expect it to keep things watered. Actually you probably don’t even set it – “some guy” comes out in spring, sets it, and sends you a bill. Even if you wanted to set it yourself, the controller in the garage is being guarded by monstrous spiders, and the manual has been translated through multiple foreign languages until your English version is incomprehensible. So, exactly what should you do? You must continually check the pulse of your landscape’s watering needs, and adjust the timer accordingly. How often should you do this? I would make adjustments to the timer weekly. Pick a day and time. After you do this a few times, it will only take a minute. Better yet, change it whenever the weather changes: wind, temperature, rain, humidity, clouds, and angle of the sun (seasonality). You will find yourself having to change the timer less than weekly if you are responding the weather changes. What settings should I use? Watering zones can be thought of as rooms in your house. (In fact, some houses have heat/AC zones with their own independent thermostats.) Individual irrigation heads can be thought of as air supply vents, blowing out water instead of heated or cooled air. There are no universal settings. You will have to experiment with different settings for different zones. You can start with 30 minutes per zone per week. You will have to compromise. For example, a zone may have five sprinkler heads, but one may be in a shady area of the lawn or beds, and the other four will be in the sun and need more water. My system has a rain sensor. Doesn’t that solve the problem? A rain sensor is a very crude device that prevents your irrigation from running in the rain, or immediately after a rain. It is not an aquastat. YOU are the aquastat. YOU are the brains of the operation. It’s better to run the system just once a week for a long time, even during dry periods, than run it two or three times a week for short periods. Plants (including lawns) do not grow well when they have frequent shallow waterings. You can run different zones on different nights. They don’t all have to run on the same night. Keep the system turned off most of the time, especially in spring and fall. If we are getting an inch or so of rain every week, leave it off and don’t even think about it. Be the aquastat. Every YEAR is different. Every WEEK is different. In some years, we get regular rains. Some years though, have extended severe droughts. There will be years in which you never run the system! Your lawn will survive going brown and dormant. You only irrigate it to keep it green, not to keep it alive. Your garden perennials may or may not survive drought – it depends on the variety. I personally don’t have an irrigation system in my yard. During a typical year, I may pull out the hoses and do a thorough watering about a half dozen times. I may water dry, shady areas a few more times than that. The problem with perennials, unlike your lawn, is that once they turn brown, that brown foliage is not going to green up again. You will have to put up with the dead and disfigured foliage the rest of the year, or cut it back and wait for new foliage to grow back, which it may or may not do depending on the plant.